These are my classiest beaded socks. These are wonderful for weddings, christenings, church, pageants, etc.! 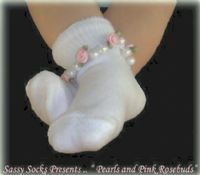 Each sock has been hand-crocheted, attaching pearls around the cuff of each sock.